This popular vehicle is a great car for a young family that is looking for an upgrade from a compact car and who need more space! 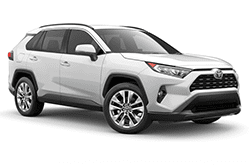 Big size, great quality, impressive build, and a pleasant driving experience are all waiting for you to experience first-hand with the Toyota Rav4! It has great fuel efficiency, powerful engine, great control, advanced safety features, custom interior options, and much, much more! Its spacious interior is comfortable and seats 5 and also has a large amount of storage area in back. You can enjoy a 8.6 L/100km or 32.8mpg fuel efficiency and the safety features you want like ABS, airbags, and more. Get it today and see what it is like for yourself!